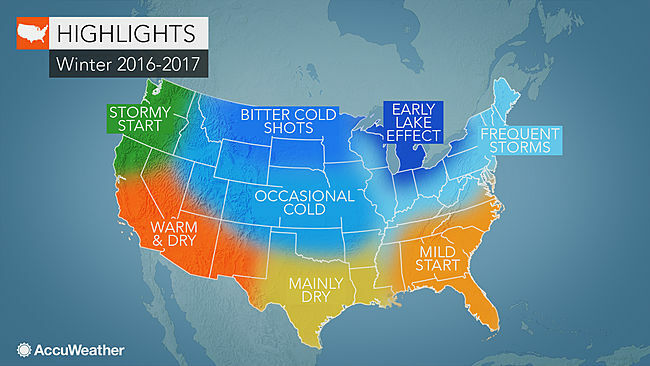 It will feel like an extended winter for those living from the northern Plains to the eastern U.S., as cold and snowy conditions stretch into spring 2017. Meanwhile, drier and milder weather will focus on the majority of the southern half of the nation. The Southeast may mark the exception as a chilly January threatens to damage the region's citrus crop. "But still, Boston, Hartford, along the coastal areas up into Connecticut and southern New England, they can still have a fair amount of snow," he said. The chill could spell disaster for the area's citrus farmers. Related: Remember Winter Storm Jonas? Old man winter won't hold back in the northern Plains this season with shots of brutally cold air predicted to slice through the region. "...There are going to be some nights, especially if there's snowcover in the heart of winter, that could get down to 20 or 30 below, especially in parts of Minnesota like International Falls and Duluth and parts of the Dakotas," Pastelok said. "I do feel we're going to kick this season off pretty quick, especially the western lakes. But I think even the eastern lakes will get involved and it will extend all the way out to January," he said. "The area of the country that may miss out on big [snow] storms this year may be Dallas and Little Rock," he said. However, a few disruptive ice events are not out of the question.